Gov. Rick Scott met with business leaders in Broward and Palm Beach counties last Tuesday to get their input on what tax cuts he should propose to the legislature since the state will have a budget surplus in 2014. Their biggest concerns included rising personal property taxes and insurance costs, and taxes that affect businesses moving to the state or startups trying to grow. The stops were part of Scott’s tax-cut tour across the state. Scott has pledged to cut taxes and fees for the state by $500 million in the 2014-2015 budget, the same year he would run for re-election. “How do we give the money back to you, the taxpayers? I’m putting it back in your hands,” Scott told the group at the Palm Beach County Convention Center Tuesday morning. Kelly Smallridge, president of the Business Development Board, the economic development agency for Palm Beach County, said when recruiting businesses to the area, Florida’s tax on commercial leases is an issue in being competitive with other states. “We’re one of the only states that has a tax on commercial leases,” she said. Real estate broker Robert Goldstein suggested to the governor the commercial leasing tax be reduced by 1 percent each year until it is phased out. “We’re at a competitive disadvantage,” he said. The current tax is 6 percent. He said the impact on economic and job growth from eliminating the tax would far outweigh the tax revenues. Several small business owners, including one who provided a sample of his company’s popcorn to the governor, attended the meeting at Broward College in Fort Lauderdale. Rosana Santos Calambichis, owner of Davie catering company Big Chef, said she would like to see a reduction in the tax on fuel — her business has seven trucks — as well as the state tax included in insurance coverage and the commercial lease tax. “It adds up quickly,” she said. Broward College radiology student Shelda Simon, 19, got her 15 seconds of fame — and a photo with the governor — after asking him why so many young graduates are unemployed. “There are plenty of jobs around the state. But you have to get the right degree,” Scott told her. Life science business owner Ken Kirby said the governor should consider proposing a new life science fund for startup businesses in the sector now that it has invested millions of dollars in Scripps Florida, in Jupiter, and other institutes. “It seems a shame to waste the momentum,” said Kirby, whose company TransDermal Delivery Solutions Corp., which has developed alternative systems to deliver drugs to patients, opened a new headquarters in Palm Beach Gardens last year. Florida expects a budget surplus by the time lawmakers draft the 2014-15 budget. A new forecast released Sept. 4 shows a surplus of $845 million in fiscal 2014, even after meeting current enrollment needs for schools and health care programs such as Medicaid and setting aside $1 billion in reserves, according to a draft report released Sept. 4 by legislative appropriation committees and researchers. The surplus is mostly due to a recovering economy, said Amy Baker, state chief economist. “People here have more money to spend and more tourists are spending money here,” she said. While general revenues are increasing due to pulling in more sales tax, the budget constraints have shrunk as some state programs were eliminated or reduced during the recession. But forecasters warn that more than half of the surplus — $449 million — is a one-time windfall. 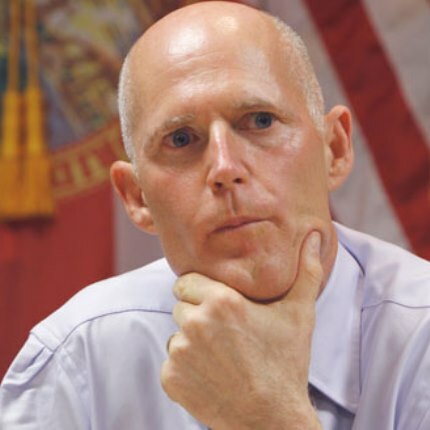 In recent weeks, Scott has promised to spend an additional $70 million on environmental projects dealing with the Everglades and Lake Okeechobee in the coming year, which could come out of the surplus. Another target could be auto tag fees that were raised in 2009 when Gov. Charlie Crist was in office. Crist, now a Democrat, is expected to challenge Scott in the governor’s race in 2014. Gov. Scott made a pledge in 2010 to eliminate the corporate income tax, which generates about $2.1 billion a year. But Florida lawmakers have steered away from the massive tax break, which would benefit mostly larger companies. The “It’s Your Money” tour continues over the next three days in Jacksonville, Tampa and Orlando.